Samsung is one of very few companies that is capable of offering such a diverse product lineup and is committed to offering more choices based on the Windows 8 and Windows Phone 8 platforms for consumers. 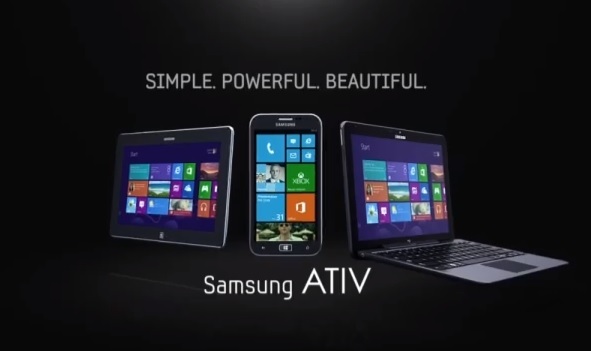 With the introduction of Microsoft's Windows 8 and Windows Phone 8 operating systems, Samsung debuts "ATIV", the new brand for its Windows-based devices which includes the ATIV SMART PC, ATIV Smart PC Pro, ATIV Tab and ATIV S.
Samsung's ATIV devices are simple, powerful, and beautiful. Together, Samsung and Microsoft will provide users with an advanced, productive and creative experience with its ATIV devices. Its full lineup is designed for a simple user experience to share your work and ideas, as well as enjoy consuming content.